CMM Inspection... Advanced Measurement Labs, Inc. We are a professionally managed dimensional inspection and measurement Company providing customized first article inspection services uniquely for each of our customers. It may be a single piece inspection or a complete receiving inspection assignment. For over 24 years, our customers continue to return with repeat business or refer us to their Engineering partners World-wide for Quality services, Professionalism and Integrity. Advanced Measurement Labs welcomes your quality teams to come visit us for an audit of our Quality Systems & Procedures. Contact us today to schedule an appointment. What Does Advanced Measurement Labs, Inc. Do? AML offers contract dimensional inspection services using Coordinate measuring machines and non-contact inspection systems as a cost effective solution for your in house inspection needs. More companies are finding that AML’s shop rates are competitive and much lower than their in house burden rate. On-going in-house training has been an important element of AML’s success. Our technicians are always up to date and current with blue print interpretation and application of GD&T. AML’s open door policy, gives our customers the unique opportunity to interface with our technicians and get a good communication and confidence level on the work being performed. Our customers appreciate this aspect and return for this reason besides quality, turn-around and competitive costs. Advanced Measurement Labs., has the equipment and the expertise to handle the most complex first article inspection requirements seamlessly. We help alleviate your inspection gridlocks or back logs by serving as an extension of your Quality Control department. You are able to ship your product to the marketplace faster than your competition and above all beat the CRITICAL deadlines. 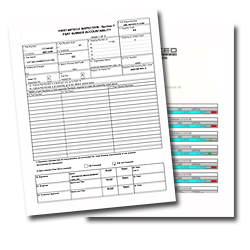 Our customized inspection reports help with easy communication between engineering staff and vendors. You are freed up to focus on other pertinent matters, while AML focuses with our undivided attention to your inspection priorities. You no longer have to worry about purchasing new inspection equipment, floor space or hiring trained man power. Using AML is a Win-Win situation. Advanced Measurement Labs, is used by many Companies to assist with their receiving inspection as well. The vendors directly interface with AML to deal with rejections and our customers never have to deal with inventory they should not be paying for -- GREAT additional savings that would otherwise go un-realized. The inspection reports are an integral part of the process. 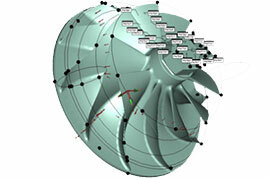 With available technology, the inspection reports can be customized for any specific need and reports can be transmitted to your Engineering group or vendors without delay. Our calibration records are traceable to The NIST and our reports are archived for ten years. AML is accredited to AS 9100 Rev D & ISO 9001:2008 and in conformance with ISO/IEC 17025, ANSI Z540-1-1994. 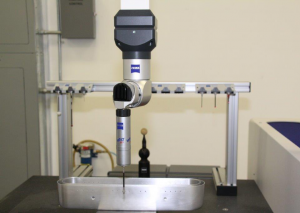 Our dimensional inspection services are brought to you by a hands-on team of the finest Lab managers, CMM operators and programmers in the business. Your cost savings are a result of efficient dimensional inspection professionals who analyze and generate creative ways to deliver the services in the shortest yet most efficient manner. Many of our clients are located remotely, thousands of miles away, yet with the current technology communication has never been easier.